California artist, Laurie Barmore, is an abstract expressionist painter. Developing her own techniques with an underlying structure and multiple layers, Laurie's work is rich with texture, color, and movement and has been described as "visual poetry". Poetry, in fact, inspires her work, as well as a love of the forms and designs found in nature and the deep core questions and human experiences common to us all. Laurie was born in New York and moved to California at the age of five. Her teen years were spent living in the coastal mountains of Santa Cruz, and she passed many hours on horseback or exploring the forest behind her house with her dog. These experiences fundamentally influenced her developing way of seeing color, light, and pattern in the textures of the forest. Family camping trips and beach excursions were also instrumental in developing her love of the natural world. In college she earned her BS in Nursing. After graduation she married and went on to raise a family while continuing to work- first in the ICU and more recently in the Recovery Room. Although throughout her life she had explored various art forms, it was in her thirties that she experienced an increasing desire to paint. She enrolled in her community college and spent several years studying drawing, painting, and color theory. It wasn't until she left school and ventured out on her own that she gravitated toward an abstract style. She discovered abstract painting was a way for her to let go and find freedom of expression. 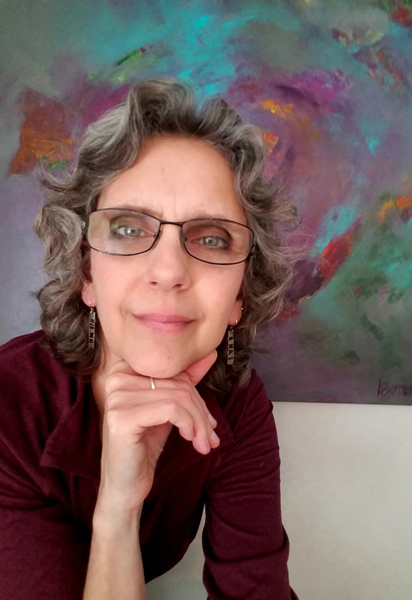 Working in her specialty in nursing was very exacting and fit with her meticulous nature, but in her art, she desired to create and express from a deeper inner emotional place. An abstract painting style allowed her to do that. Collector Don G. from the bay areas states " Your paintings reflect a passion and intensity..they reach into the soul and draw the viewer in." Laurie's work has been influenced by Georgia O'Keefe for her organic forms, Van Gogh for his movement, energy, and vibrating color, and Joan Mitchell for her lyrical line. She has shown her work in Art Festivals, juried exhibitions, and restaurants. In 2017 she was included in her first museum group show at the Triton Museum of Art in Santa Clara, Ca. She is a member of the Valle del Sur Art Guild in Morgan Hill, CA. Her work is in personal collections in California, Arizona, Oregon, Washington, Hawaii, and Canada. Laurie is currently living and working in Gilroy, California. In her free time she enjoys tending her garden, combing the beach, spending time with family, and journaling.